As a digital graphics printer, the key to profitability is a productive workflow. Keeping your equipment and operators productive is a requirement that directly affects your bottom line. By Bryan Manwaring, Director of Product Management, Onyx Graphics, Inc. It's not just about how fast your RIP processes a file or how quickly your printer outputs the job, it's about total throughput - the efficiency of the workflow to move the job from pre-production through print and finishing in the least amount of time, with a minimum of consumable waste. Print service providers (PSPs) are facing increasing challenges in handling the growing complexity of design files they receive. In addition, as businesses grow, product offerings expand, and new printing technologies are added, PSPs may experience "printer islands," complicating their ability to produce consistent, predictable color across all production devices. Each printer has its own RIP, so a PSP often becomes dependent on an individual operator to be the printer/RIP expert. With employee turnover and the need to maximize production efficiency to stay competitive, most PSPs are beginning to see the financial benefits of a streamlined production workflow. Has this ever happened in your shop? One of your high profile clients has given you an important job with rather tight time deadlines. Your normal print operator is out sick that day. Rushing to meet the deadline, you catch a design error with the file after the job has been printed on expensive media. The file must be corrected and rerun, jeopardizing your ability to meet the client's deadline and ensuring a loss on the job. You're printing a campaign for a client's upcoming trade show booth. The job includes vinyl signage, rigid materials and a fabric backdrop - all with similar images and all-important corporate colors. All colors must match across various media for the booth to look right, but they don't. And time is running out. Why are there so many challenges in wide-format graphics printing? RIP software is a necessary tool for rendering files and printing. Workflow software has all the benefits of a RIP - plus the ability to tackle additional problems that might affect your print shop. To understand the difference, it may help to look at how we got to the "printer island" environment many PSPs experience today. Most PSPs work in a production environment with a variety of different printers and finishing devices. The result on one machine is not the same as on another, whether from different manufacturers, or different printers from the same manufacturer. Additionally, as shops add printers, many PSPs find that each may be run by different RIP software, which also leads to differing results. Not all RIPs are created equal, and each uses different technologies. In an environment like this, achieving consistent, predictable color across all production devices is a major struggle. There are also challenges with file complexity. The Adobe Creative Suite software is used extensively for graphic design. Adobe has added many features over the years that make designs look great and easier to build, but these features make the files increasingly complicated and very difficult to print. PSPs need to handle the challenges of many transparency layers, gradients, overprints, and a mixture of raster and vector elements, to name a few. While a PSP's in-house designer may understand how to correctly create the file in the design phase to minimize printing problems, customers often do not. A file may look fine to the designer on screen, but the way the file was created may cause printing problems. Bottom line - when designers create graphics files, they don't always design with printing in mind. Visibility to overall shop productivity becomes more difficult as the number of printer/RIP combinations increases. In order to submit, control and monitor jobs throughout the shop, a PSP needs to move among the various independent RIP workstations trying to optimize operator and output device productivity, minimize bottlenecks, and avoid the "bad day" scenarios. What process steps do PSPs use to handle printing issues? Pre-flighting complicated design files can be a painful process when dealing with transparent elements, gradient mesh features, etc. To avoid potential problems that arise when flattening vector files, a PSP will often save the file as a TIFF image, flattening it in the process. This solves the problem of transparency layers and font substitution, but results in a very large file, and one that isn't scalable. A three- to four-megabyte PDF could become a gigabyte TIFF, producing a "predictable" print file because all the rendering decisions have been made. In comparison, vector files can present problems if the transparent objects are not flattened correctly, the correct fonts are not included, or the color has not been defined properly, but they do have more flexibility, can be scaled and are smaller in size for quicker processing. To cope with increasing file complexity, different color engines in multiple RIPs, and varying printer color gamuts, PSPs have become dependent on the knowledge and expertise of individual printer operators to deliver a printed piece that matches the client's intent. Unfortunately, the position of printer operator often experiences high turnover. As a digital graphics printer, the key to profitability is a productive workflow. Keeping your equipment and operators productive is a requirement that directly affects your bottom line. It's not just about how fast your RIP processes a file or how quickly your printer outputs the job, it's about total throughput - the efficiency of the workflow to move the job from pre-production through print and finishing in the least amount of time, with a minimum of consumable waste. As print shops grow, the "printer island" approach of independent RIP/printer combinations compromises the ability to have consistent, predictable output across all print devices. Workflow software builds on the strength of RIP software by adding the ability to scale production as a business grows, and provides tools for improving the overall production process. It offers better predictability through consistent solutions spanning all of a shop's printing and finishing equipment. Workflow can be divided into three stages - pre-production, production and post-production. This process gets the file ready for submission to the wide-format printer. Flattening transparent layers, checking for correct font and color conversions, sizing, scaling, rotating, color managing for desired media profiles - finding and correcting problems in this stage is much more cost effective than fixing them after printing. Workflow software can provide a single job setup station, manned by a skilled operator with the ability to set up jobs for all of a shop's printers, thus allowing printer operators to stay focused on keeping the machines running - such as Onyx Graphics' Thrive™ workflow software, which uses a single rendering technology, based on the Adobe PDF Print Engine, for all files regardless of the graphics authoring application. Using the same rendering engine in RIPing the file as the one used to create the file provides maximum predictability that graphic elements will be converted correctly and the rasterization of complex graphic design effects - including issues related to transparency layers, mixed color spaces and spot color handling - will output as desired. Some workflow software may also include the ability to automate job setup for complicated applications like multilayer jobs using white or specialty inks, or backlit applications. This is the printing stage of the job. With new wide-format printers getting faster all the time, the software that feeds the printers must keep the print pipeline filled for optimum productivity. Workflow software can offer valuable redundancy in this stage. With workflow software, one RIP can feed more than one printer. With independent RIP/printer stations, when the RIP is down, the printer is down. 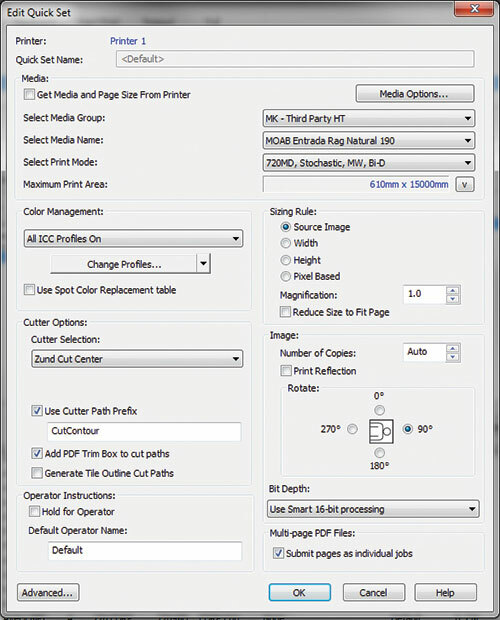 With workflow software, multiple RIPs can feed a printer. Onyx Graphics' Thrive, for example, uses a network license so that a shop can add additional job setup stations or RIPs independently of the number of printers being served. And the RIP/printer configurations can be changed as needs change. For example, two RIP stations can be configured to serve five printers, and each or both stations can be configured to serve all 10 printers. This can provide both improved uptime, as well as increased file processing speed, ensuring printers and cutters are fed at maximum capacity. This is the finishing stage where prints are trimmed, cut, laminated, grommetted, etc. Today, RIPs are integrating better with finishing solutions. As finishing solutions get smarter, additional control from RIPs can make the finishing workflow more efficient. Finishing setup information can be communicated throughout the entire workflow, automating settings such as cut marks and knife options. Nesting options have improved operators' ability to gang jobs together that need finishing, saving valuable production time and decreasing media waste. 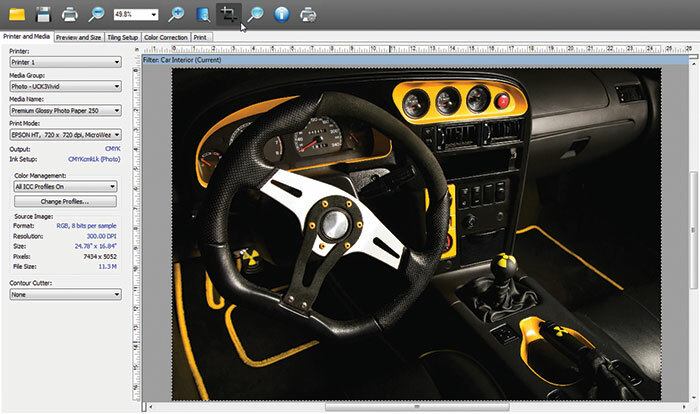 Onyx Graphics RIP and workflow software allows users to set up automated cutting workflows that make the best use of printing time and optimize the workflow for finishing. How can workflow software make a PSP more productive? With one job editing station and a single rendering software feeding all printers, a PSP can be confident in the predictable output that results. Eliminating late stage surprises enables fewer press cycles, and lowers the overhead costs related to each job. Also, with one rendering technology across all production devices, training is simplified, and employees can easily move between machines and functions in a shop. Design and setup decisions are moved to an earlier stage in the workflow where the cost to fix problems is less expensive. With scalable RIP stations that are independent of the number of printers, throughput can be maximized. Dashboards let users submit, control and monitor jobs from anywhere in their shop, optimizing both operator and output device productivity since users no longer need to move among several independent RIP workstations to accomplish those tasks. Automating job setup removes clicks and potential errors leading to faster production, less media waste and predictability of output throughout the shop. With the ability to add RIPs and Job Editor workstations independently of the type and number of wide-format printers, PSPs can build a production workflow that fits the way their shop works today, with the peace of mind that comes with the ability to scale their workflow as their business grows and changes. Printers and finishing equipment can be fed at maximum capacity by adding RIP power independent of added production equipment. 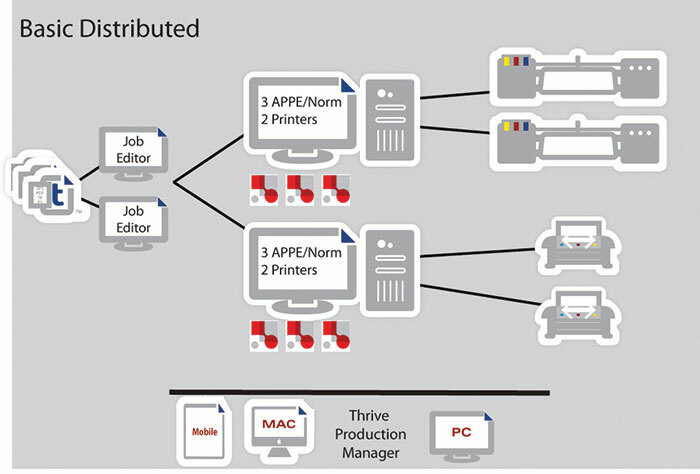 With one or several Job Editor stations feeding multiple printers, a production manager can put people "in the right seats" to optimize the production process, e.g., a highly skilled print operator can take a prepress role in preparing jobs for printing and relieve other print operators of the responsibility of setting up and editing jobs for printing, allowing them to focus on maximizing the productivity of the printer. What is the status of my job? How long do jobs take to complete? Where are the bottlenecks in the shop? How much ink and media is being used? How efficient is the shop? What are the basic costs for a job on a specific printer? Investing in wide-format workflow software that streamlines and optimizes can critically impact the "big picture," improving overall operational performance. It's possible to simplify pre-production processes, increase productive output, and improve post-production output while eliminating traditional bottlenecks in these stages. When the overall operational performance of a shop is improved, so, too, is the ability to increase revenue and expand operations. Increasing profitability is directly linked to the ability of a shop to decrease costs tied to variables such as labor, consumables, and rework, even file processing time. With a highly productive workflow solution, it's possible to overcome these challenges. A common job editing software for all print devices means predictable results across all production devices, reducing waste and the costs associated with reprints. Redundancy and flexibility in RIP servers means less downtime and increased processing speed, and distributed workflow modules streamline production and reduce turnaround time. Growing an organization's volume and revenue can be inhibited by an inability to offer new services, competitive pricing, or even open new locations. Upgrading to a workflow software solution that delivers reliable, predictable quality output consistently across all production devices, and is adaptable to expanding business needs can set an organization apart from its competition. Also, with a productive workflow that cuts out excess waste and inefficient processes, it might be possible to shave dollars off operating costs, which could be passed on to customers in terms of more competitive pricing, or used to invest in the organization's future growth plans. Look for workflow software to continue to evolve to make a business more successful and profitable, and help a PSP better understand its costs. Whether you're a shop with just one printer now but looking to grow, or a full production shop with numerous machines, workflow software can make your growth or existing business more efficient and provide the tools needed to optimize your business. This article appeared in the SGIA Journal, May / June 2014 Issue and is reprinted with permission. Copyright 2014 Specialty Graphic Imaging Association (www.sgia.org). All Rights Reserved.